The unique blend of ingredients (Cedar Oil, Cinnamon Oil, Clove Oil) in this product trigger escape/avoidance behavior in snakes. Snakes actually taste the air around them (via a receptor organ known as the Jacobson’s organ). This product provides a powerful scent/taste repellent that snakes find unpleasant and which triggers a natural reaction to escape and avoid. 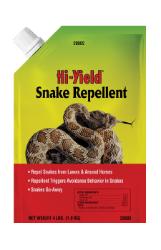 Hi-Yield® Snake Repellent does not harm snakes, it drives them away, naturally. Lightly sprinkle a band 6 - 8 inches wide, next to and around the area you wish to protect. It is not necessary to completely cover the ground with product. One pound will treat a band 8 inches wide by 50 feet in length. If after 2 weeks no snakes have been observed, a broadcast/maintenance application may be made at the rate of 1 lb. per 100 sq. ft. Do not water in after application. Reapply product after heavy rains or every two weeks to obtain best results.